Shipwreck Marquette AKA Republic was unanimously voted to the State Register of Historic Places on Friday July 20, 2007. 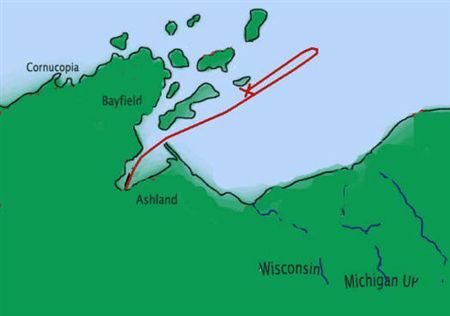 This was a joint project between GLSPS, the Wisconsin Historical Society - State Historic Preservation Office, and Great Lakes Shipwreck Research Foundation. 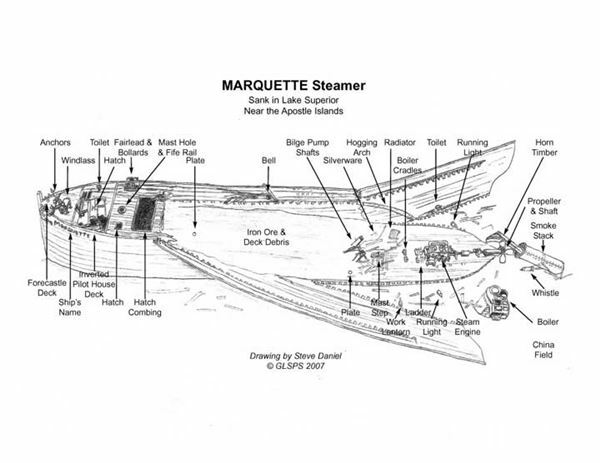 The Marquette was a wooden bulk freighter which sank off Michigan Island of the Apostle Islands in 1903. It now lies in over 200 ft of water. 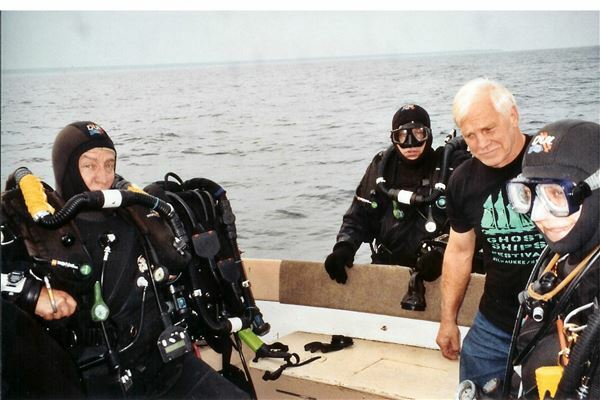 The wreck was discovered in 2005 by the team of Jerry Eliason, Kraig Smith, Randy Beebe, and Ken Merryman, but was not dived until 2006. GLSRF gave GLSPS a grant of $1000 to fund the work. GLSPS members Steve Daniel, Bob Olson, Mark Yanik, Lee Selisky, and Ken Merryman did the site recording and exploration working with Keith Meverden and Tamara Thomsen from the WHS. Tamara shot over one hundred still images of the site. Ken Merryman shot close to two hours of video and Steve Daniel did the site drawing. GLSPS hired Brendon Baillod to do the historical research and context write-up. Keith Meverden did the site description and Tamara did the final editing and put the nomination together. Working together, the team completed the task in less than one year which is pretty good for national register work. Expenses came in under budget which will allow GLSPS to continue the nomination work on the shipwreck Moonlight this year. On February 13, 2008 the nomination passed the national review board and the Marquette was listed on the National Register of Historic Places. This is the second shipwreck nomination sponsored by GLSPS to gain the listing on the National Register. Establishing these shipwreck sites as historically significant sites helps protect them from potential claimants and those who would pilfer the artifacts. It is our hope that this site with its artifacts will remain intact for divers and archeologists to enjoy and study. 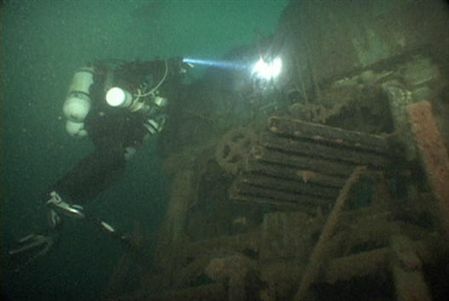 If you dive the site please refrain from moving artifacts since the positional information is important for future studies of circumstances surrounding the sinking as well as studies of ship layout and construction. Our thanks to Keith Meverden and Tamara Thomsen for their patience in working with us. This is a new area for GLSPS to contribute their help and we are learning the process as we proceed. We would also like to thank the GLSPS team that did the site work and Brendon Baillod for his work on the historical write-up. Steve Daniel and Ken Merryman confer on site sketch details. Marquette route on its final voyage in 1903. 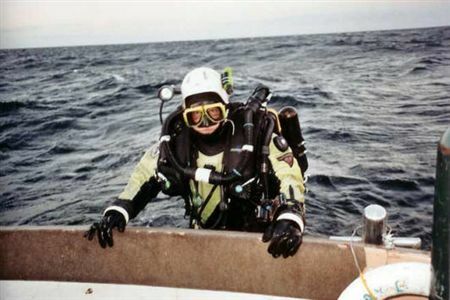 Bob Olson returns from his Marquette dive in some fairly rough water. 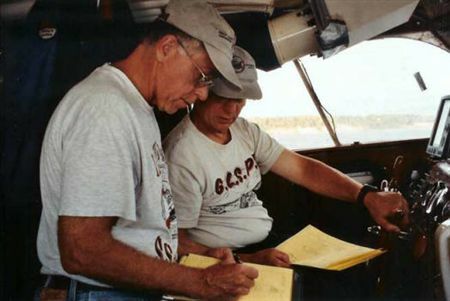 Steve Daniel studies Marquette engine to gather information for the site drawing. 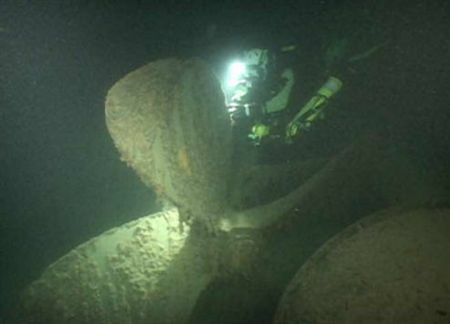 Bob Olson swims over the Marquette propeller as he explores the new site.